The Defence Headquarters says security forces have repelled an attack by Boko Haram militants on Gombe, the capital of Gombe State, in north eastern Nigeria. Heavily armed members of the sect were said to have overwhelmed a security checkpoint at the outskirts of the city, before moving in to attack an Army barracks there. The Police Spokesman in Gombe State, Fwaji Atajiri, said the militants threw grenade into the Army facility, which exploded and set off an inferno, but no casualty figure was reported. Residents were said to have fled the area to escape the violence after they heard sound of heavily artillery. 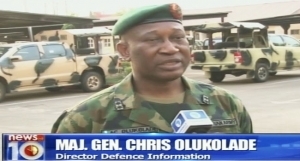 However, Defence Spokesman, Major-General Chris Olukolade, said troops have successfully beat back the terrorists and pursuit has continued to ensure that they are effectively removed from the state. Olukolade confirmed that the Gombe attack was used to distribute materials aimed at causing voter apathy amongst Nigerians resident in the state. Boko Haram militants have launched several attacks on Gombe city in recent times but has not been able to establish any foothold in the state.